"A convenient, comprehensive guide to the language of law. Over 10,000 entries. Includes pronunciations, example phrases, and usage notes. Special sections on the judicial system, legal cases, government agencies, and historic laws." To the ordinary person, who hasn't spent three years grinding through law school, legalese gets its point across as clearly and effortlessly as a dose of ancient Greek. Right up there with medical lingo, legal jargon confuses and alienates folks, makes them feel stupid and ill at ease. A translation or two, however, can go a long way toward clearing the legal air. With concise and sensible definitions, Merriam Webster's Dictionary of Law converts a lease, will, or summons into standard English, and removes the intimidation factor from what is, basically, an effort at reliable communication. Been wondering about tortfeasors and arrears, peculation and naked promises, John Doe summonses and Terry stops? 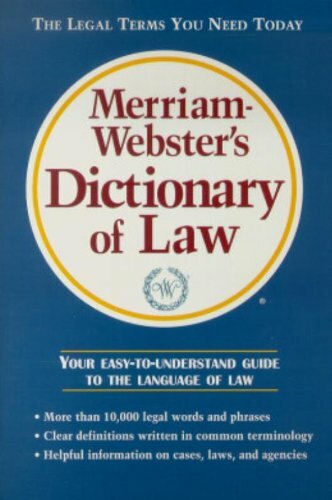 From ABA (American Bar Association) to Zone of Privacy ("an area or aspect of life that is held to be protected from intrusion by a specific constitutional guarantee"), the dictionary defines and explains 10,000 legal terms, allowing a ready grasp of laws, statutes, and legal procedures to anyone who knows how to crack open a dictionary.